By Carmen Inoa Vazquez, Ph.D.
and American cultures and dramatically reducing cultural conflict in the family. to use these methods immediately in daily life — from family relationships to children’s friendships to school issues. — Harold S. Koplewicz, M.D. 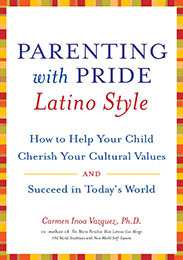 As you can see, this is a book you will want and will want to give as gifts to multicultural parents. Here’s a quick way to tell people about this book. colleagues,” and sign your message.